The event was regular weekly Golden Age Constructed. 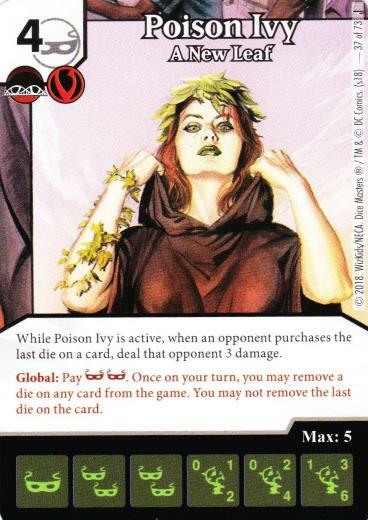 The global on Poison Ivy: A New Leaf received some attention when it was spoiled well before the Justice set actually came out. But, once the set did come out, as far as we at DM North have been able to determine, this global’s existence has had a negligible impact on the game. When you think about it, it’s not hard to see why. Between the two mask cost, and the limitations, it’s really not that powerful. In most situations, zapping a die before the opponent can buy it barely registers as an inconvenience. It sort of looks like the global has some synergy with Poison Ivy’s own character ability, but that ends up meaning very little in practice. Very rarely will a player be able to field Ivy and remove all but one die on an opponent’s card before that opponent manages to buy a die of that character/action. And it’s fairly rare they need more than one. I’ve concluded there are two situations where this global might be worth the bother: removing Swarm dice and Fabrication dice. The first will hurt the opponent’s ramp, and the second will reduce the number of KO triggers available to the opponent (and having an easily available KO trigger is generally the reason players run Golems in the first place). So, under ordinary circumstances, this global is just not that useful. But, I asked myself, is there a way to make it more useful? So, I attack with Madame Web, move opposing character die of my choice to her card, then remove it from the game with the Ivy global. The Ivy global can’t be used on the last die on a card, but if I haven’t purchased all the Madame Web dice I started with, the unpurchased dice are still ‘on the card’. At this point, dear reader, I don’t know how you’re reacting to what you just read. But gibbering quietly, eyes bugging out, and swearing a blue streak at your computer screen are all in the betting pool. I will address this some more in the Post-Mortem. But, for now, on to the rest of the team. Every Madame Web die that attacks removes an opposing die from the field. 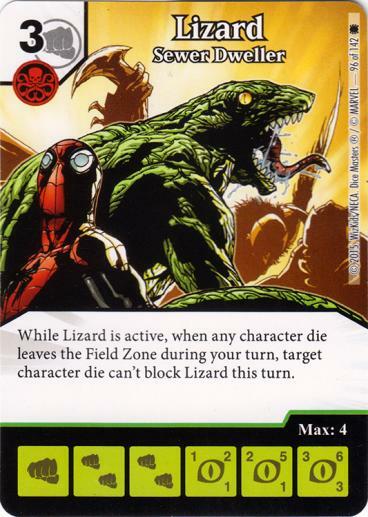 And for each one that’s removed Lizard can name another die that can’t block him. Now, I’m going to want mask characters, so I have masks to fuel the Ivy global. So I added common Morphing Jars and common TOA Doppelgangers. The latter are masks, and I can turn them into extra Madame Webs or extra Lizards as the situation warrants. Now, Lizard has decent punch on L2 and L3, but he also has the glassiest of jaws on L1 and L2, so I decided to include common Wrecker as an option help boost Lizard’s D. I also added energy field as a BAC, giving me a couple of means (the global and the action) of spinning up my characters, particularly Lizard. With all the masks, I decided to run Global Clayface. I decided my last character would be R Enchantress, to give me a means of taxing global usage if my opponents decided to try to use my globals against me. My second BAC was Misdirection. It gave me another potential ramp option aside from CFG, and possibly a way to sidestep Lizard’s onerous fielding costs. Parallax, Golden PXG, Morphing Jars, Elf Thieves, Wongs, and Intimidate Yellow Lantern Ring. I got Enchantress out fairly early and she actually slowed him down a little bit – on the turns where she wasn’t Intimidated away. It was a slow game, and I spent most of my energy on buying my characters rather than removing his, though I did remove a few of his unpurchased dice. He was an excellent sport when I unveiled my little surprise, agreeing that the way it’s worded it does seem to work. We ended up going to time with him ahead on life, and me unable to change that in my final turn. This was against the group’s resident youngster who was running a Justice League team supported by Global Clayface. I wasn’t going to use my little surprise against her fielded characters. I did attack regulary, removing her non-Sidekick characters (temporarily) with Madame Webs to force her to block with Sidekicks to try to thin her field. It didn’t actually work all that well. She waited until she had enough characters in her field to total 20A, then swung with everything. She didn’t consider that I had plenty of characters to block with. I ended up KOing her entire field while losing almost nothing of my own. When my next turn started, I had 20A in my field, and her field was empty. Maybe I should have cautioned her about that not terribly well advised attack, but considering we were the last game in the round still going, and I suspected we were getting close to time, I decided to let her learn the lesson the hard way. Up against Jourdo’s Orbital Strike team. He knew about the Madame Web/Ivy global combo and wasn’t eager to leave his character dice around to be stolen. That meant he was leaving his field empty a lot. The dice didn’t favor him on the Orbital Strikes he got in, and eventually I had 20A available to send rampaging through his empty field. He had the Batwoman that can’t be blocked when she attacks with a Villain, and Utility Belts to buff her A when she came through. He had an unblockable Batwoman hit me for 6, but shortly theeafter he had only two character dice in his field. I had a L3 Madame Web in mine, and fielded a L3 Doppelganger to become a second L3 Madame Web. That took his only potential blockers out of the equation, and I had enough other attackers to get to lethal. This week, it’s much more about the combo, than about the team as a whole. So what’s the verdict on the combo? It’s a parlor trick. It’s a good parlor trick, but only that. It’s much more effective as a deterrent than an actual tactic. Jourdo left himself wide open in our game because he was overly concerned about it being used against him. But consider this – in only one of 4 games, did I actually take an opponent’s die from the field and remove it from the game. And the game where I did that was the only game I lost on the night. The combo is just removal. Removal with teeth and on steroids, perhaps, but only removal. And Removal is not a win con. On to the legal wrangling. but if it’s legal for Billy Club it should be legal for Madame Web and Vice Versa. 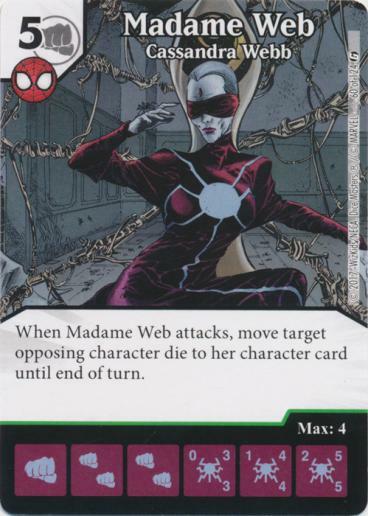 I think the biggest stumbling block for most people is going to be conflating dice on the card because they’ve never been purchased with dice on a card because they’ve been place there by a game mechanic, in this case Madame Web. Is that the same thing for not being the last die on the card for the purposes of Ivy’s global? 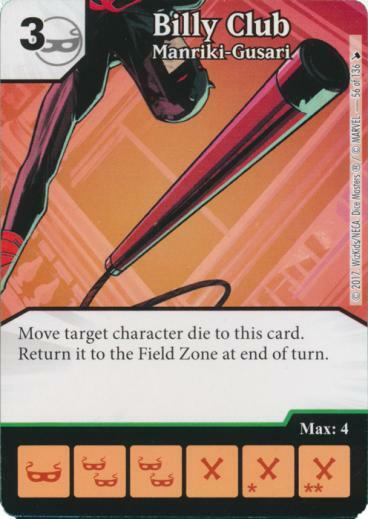 If it’s not, can I still attack with two Madame Web dice, move two dice from the opposing Field Zone to her card, and then use the Ivy global on one of those dice? I don’t know for sure, and I don’t think anyone else does either. I’d love to get answers from WizKids, but they have a long history of giving answers when they feel like giving answers, and not before. At out local scene, while there was some dissent, the general consensus was ‘The way everything is worded, the combo does work’. There was perhaps an undertone of ‘something here is worded poorly and needs to be errata’d’ but for now, our group, at least, is treating this combo as legal. So do you think the Madame Web – Poison Ivy global combo described article described in this post is legal or illegal? Why or why not? Please let us know in the comments.